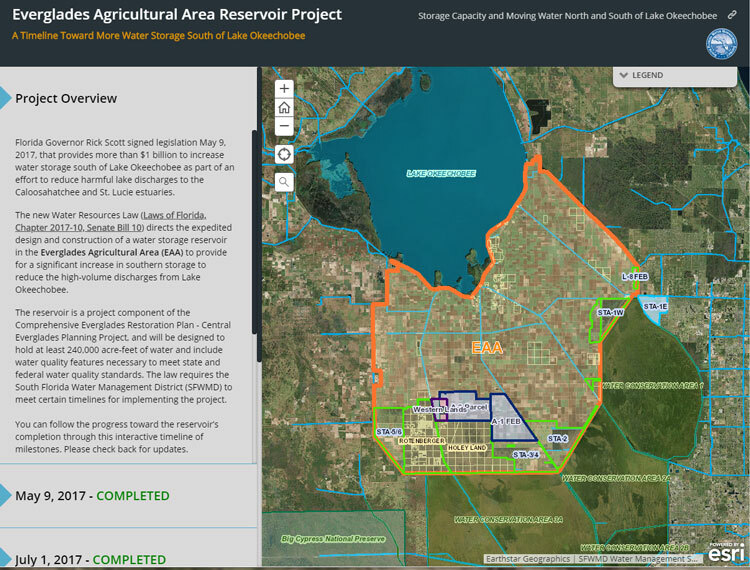 West Palm Beach, Fla. — The South Florida Water Management District (SFWMD) Governing Board unanimously approved submittal of the Everglades Agricultural Area (EAA) Storage Reservoir project Post Authorization Change Report (PACR) to the U.S. Army Corps of Engineers (USACE). This SFWMD-to-USACE handoff is a critical step to receiving federal approval and cost share toward a cost-effective and implementable EAA Storage Reservoir plan. The plan, based on a foundation of sound science, public input and following the direction of state law, includes a reservoir, new Stormwater Treatment Area and conveyance improvements that will reduce damaging discharges to the northern estuaries, meet goals for delivering additional flow of clean water to the Everglades and achieve state water quality standards. The Governing Board approved submitting the report to the USACE seeking changes to the congressionally approved Central Everglades Planning Project (CEPP) to include the reservoir. The PACR will be submitted to the Assistant Secretary of the Army, Civil Works by March 30 after the independent technical peer review is completed. The Tentatively Selected Plan (TSP) proposed by SFWMD is Alternative C240A. Together with authorized projects, C240A will send an annual average of approximately 370,000 additional acre-feet of clean water south to the Everglades that will be protected to benefit the natural system by rule or reservation. The TSP will also reduce the number of damaging discharge events from Lake Okeechobee to the northern estuaries, when used in conjunction with authorized projects, by 63 percent. The additional flows south to the Everglades proposed by the TSP will be treated in a new 6,500-acre Stormwater Treatment Area (STA) in combination with existing STAs and Flow Equalization Basins (FEBs), such as the A-1 FEB, to meet state water quality standards. The new reservoir will store 240,000 acre-feet of water on the 10,100-acre site comprised of the District-owned A-2 parcel and lands to the west as identified in Senate Bill 10. Alternative C240A will work in conjunction with Gov. Rick Scott’s Restoration Strategies for a total of 350,000 acre-feet of above-ground storage south of Lake Okeechobee. This TSP would cost approximately $1.34 billion to build in addition to the costs already included in CEPP. Achieves a 63 percent reduction in the number of damaging discharge events from Lake Okeechobee to the northern estuaries, in conjunction with authorized projects. Achieves a 55 percent reduction in discharge volumes from Lake Okeechobee to the northern estuaries, in conjunction with authorized projects. Achieves a 55 percent reduction in high-flow discharge events lasting more than 42 days to the St. Lucie Estuary, in addition to the benefits provided by CEPP. Achieves a 40 percent reduction in high-flow discharge events lasting more than 60 days to the Caloosahatchee Estuary, in addition to the benefits provided by CEPP. Sends an annual average of more than approximately 370,000 acre-feet of water south to the Everglades. For modeling data and more information on the previously held meetings, including agendas and presentations, visit www.sfwmd.gov/eaareservoir. Previous ArticleLendlease begins construction on second CLT hotel in U.S.